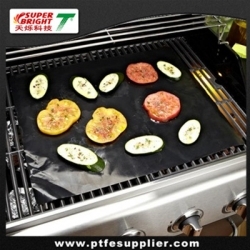 ptfe oven guard is a tray or pad placed on a bakeware's bottom rack to catch food and liquid spills before the spills can collect and burn on the hard-to-clean cookware bottom. Made of selective fiberglass fabric, with nonstick coating ---PTFE on both sides, as the non-stick coating, cleaning it typically requires little work---you need only wipe or wash away any food or spills once the liner has cooled. Place the cooking liner on the lower rack of the cookware, whenever a spill occurs in your bakeware, remove the liner immediately and rinse it off with warm water.